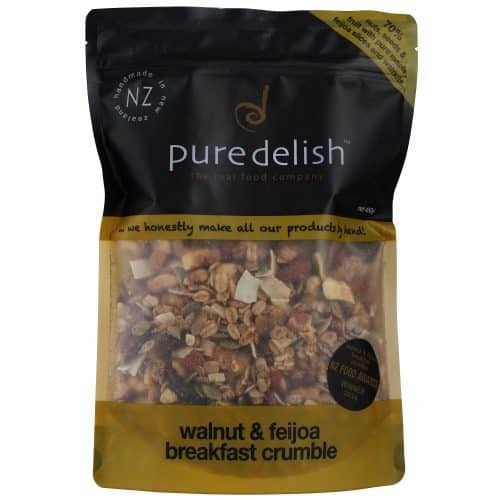 walnut & feijoa breakfast crumble is an amazing blend of nuts, seeds, rolled oats & NZ feijoa pieces – made from only the best ingredients, this delicious cereal will leave you with a taste of nostalgia for the fruit crumbles you grew up with! for an easy dessert – our canned or stewed fruit into an ovenproof dish, mix walnut & feijoa breakfast crumble with some melted butter, spread over top of the fruit, bake for 15-20 mins. Serve with ice cream! ingredients: almonds, rolled oats, walnuts (13%) pumpkin seeds, sunflower seeds, sultanas, organic coconut, honey, pure maple syrup, organic virgin coconut oil, feijoa (2%) (freeze dried), olive oil, organic coconut sugar, spices. contains oats, tree nuts, gluten.